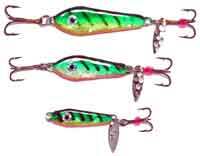 Hutch's Hawg Hunter Fishing Spoons have been around for a long time and have a proven track record. They can be vertically jigged, casted, and jigged back, or just dropped over the side of the boat and held still. These fishing spoons are real producers in the fall and winter. Always tie directly to the top of the fishing spoons — never attach with a snap because they will fowl-up frequently. And watch out for the fishing spoons' hooks because they are mean! These spoons come in 3 sizes, 1/4, 1/2 and 3/4 oz.